If you struggle with frizz, tangles and excessive curl, it’s time you looked into the Simply Smooth Keratin Treatments from American Culture hair products. Unlike Japanese smoothing treatments, which have garnered a lot of negative attention, the Simply Smooth products will not damage your hair or change your color. While some products rely on excessive formaldehyde to achieve the goal of smooth hair, Simply Smooth complies with the guidelines from the Cosmetic Ingredient Review and other governmental agencies, ensuring that our products are the safest on the market. We offer a wide range of products, so you can choose the level of smoothing you want and can control how long it lasts. You can get up to 100 percent curl and frizz reduction with a wash and wear treatment that lasts for one shampoo or get the same result with a salon treatment that can last up to 20 weeks. 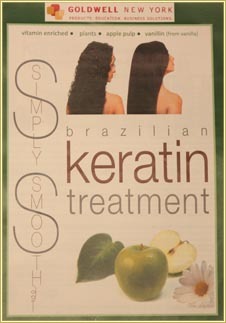 Keratin treatments work by bonding with the molecules in the cortex and cuticle of the hair strand. Cortex bonding improves the strength of your hair and reduces split ends and breakage. Cuticle bonding is what gives your hair its glossy shine. For all their effectiveness, these products are so gentle that you can have other services, such as color, highlights and relaxers the same day. Shampoos, conditioners, styling products and finishing products are available for at-home use to extend the results and keep your hair looking its healthiest. Even if you haven’t had a smoothing treatment, regular use of these keratin-infused products will benefit your hair. Come in and talk with Melissa to discover the best treatment for your hair, and say goodbye to frizz.